Prof. h.c. mult. Wolfgang A. Herrmann was appointed President of the Technical University in Munich in 1995. He is the longest-serving President of a German university. 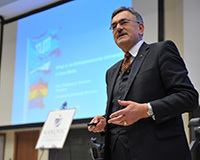 President Hermmann will present the lecture “Technische Universität München: The Entrepreneurial University” on Tuesday, April 9 at 5:00 p.m. in 101 Jordan Hall of Science. Gregory Crawford, Ph.D., William K. Warren Foundation Dean of the College of Science and professor of physics, will present the introduction. Wolfgang A. Herrmann studied chemistry at TUM. After obtaining his doctorate and lecturer qualification at the University of Regensburg and following professorships in Regensburg and Frankfurt, he took over the TUM Chair of Inorganic Chemistry from Prof. Ernst Otto Fischer in 1985. His awards include the Leibniz Prize (1987) and the Max Planck Research Prize (1991). In 2007, he received the Bavarian Order of Merit, and in 2012 he was awarded the Bavarian Maximilian Order for Science and Art. He has received eleven honorary doctorates from German and international universities. Highlights of Herrman’s term of office include TUM’s recognition as a “University of Excellence” in 2006 and 2012 as well as being recognized as “President of the Year” in 2012 by the German Association of University Professors and Lecturers. TUM has been awarded five valuable Alexander von Humboldt professorships, the number of female professors at TUM has risen from 7 to 88, and the student population has increased by 80% during Herrmann’s term in office.